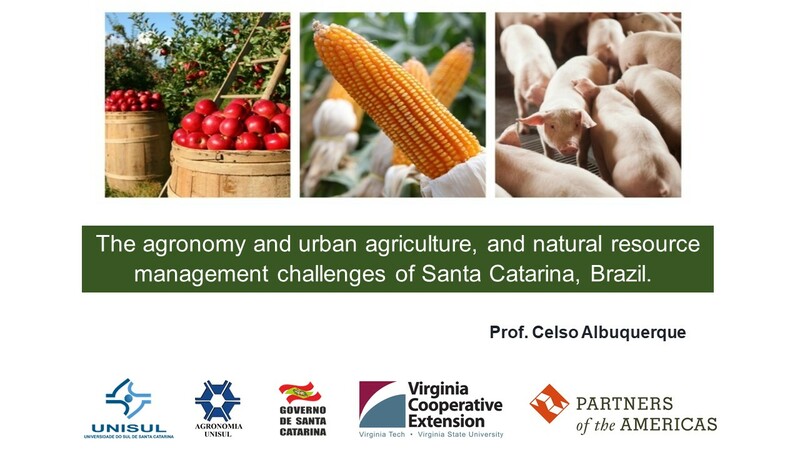 Please join Virginia Cooperative Extension in welcoming Professor Celso Albuquerque from the state of Santa Catarina, Brazil. Professor Albuquerque will talk about his work at the Universidade do Sul de Santa Catarina (UNISUL) in Urban Agriculture, Agronomy, and Natural Resource Management Challenges. This entry was posted in Public Education, Urban Agriculture and tagged Agronomy, Brazil, Natural Resource Management Challenges, Professor Celso Albuquerque, Santa Catarina, Urban Agriculture. Bookmark the permalink.